MPPGCL Accounts Officer And Junior Engineer Admit Card Check Here. MPPGCL Notification is out. 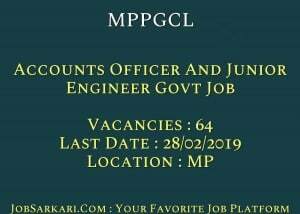 MPPGCL is recruiting for 64 Accounts Officer And Junior Engineer Govt Job Posts. You can check MPPGCL - Madhya Pradesh Power Generation Company Limited last date, download MPPGCL notification, visit MPPGCL official website and check other MPPGCL Vacancy details.Complete Vacancy and recruitment Details about 64 Accounts Officer And Junior Engineer Govt Job vacancies in MPPGCL are provided below by JobSarkari.Com only for you. Accounts Officer (Backlog). 01. 00. 04. 04. 09. JE (Plant). 28. 08. 08. 11. 55. Total Vacancy. 29. 08. 12. 15. 64. Accounts Officer (Backlog). Candidate Must Have Passed CA From ICAI or Cost And Management Accounting/ ICWA. Having MBA in Finance/ PGDMB in Finance With 60% Marks (50% Marks For SC/ ST). JE (Plant). Candidate Must Have Passed Full Time Diploma in Mechanical Engineering/ Electrical Engineering/ Electronics/ Instrumentation/ Electronics And Telecommunication/ Electrical And Electronics. Accounts Officer of MP State Candidates. 21 Years. 40 Years. Accounts Officer of Other State Candidates. 21 Years. 28 Years. Junior Engineer of MP State Candidates. 18 Years. 40 Years. Junior Engineer of Other State Candidates. 18 Years. 25 Years. Age Relaxation. 5 Years For OBC/ SC/ ST/ PH/ Female of MP State Candidates. Q. What is the Last Date For MPPGCL Accounts Officer And Junior Engineer Govt Job Vacancy ? A. 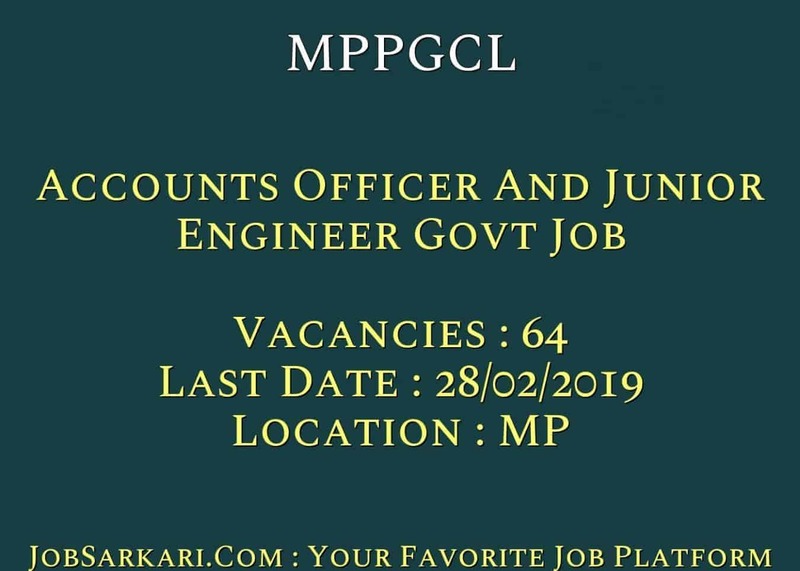 Last Date for MPPGCL Accounts Officer And Junior Engineer Govt Job Posts is 28/02/2019. Q. What is the Form Type of MPPGCL Accounts Officer And Junior Engineer Govt Job Recruitment ? A. The Form Type for MPPGCL Accounts Officer And Junior Engineer Govt Job Posts is Online. Q. How many vacancies are available in Madhya Pradesh Power Generation Company Limited Accounts Officer And Junior Engineer Govt Job Posts ? A. There are about 64 Vacancies in Madhya Pradesh Power Generation Company Limited Accounts Officer And Junior Engineer Govt Job Posts. Q. What is the Full Form of MPPGCL ? A. Full Form of MPPGCL is Madhya Pradesh Power Generation Company Limited .